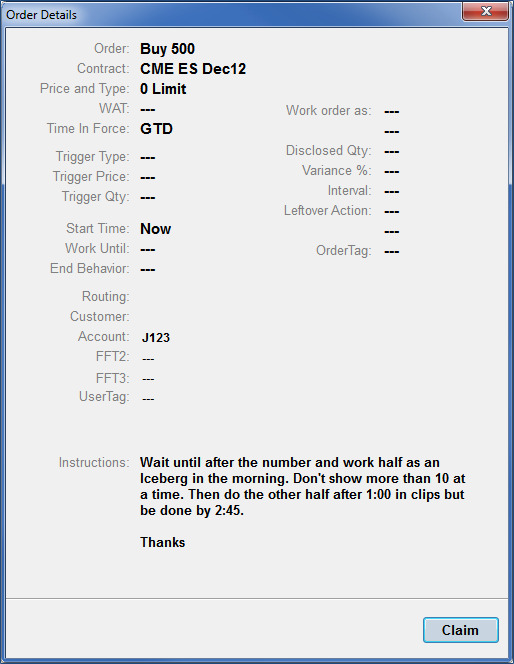 X_TRADER Pro users with the parameter Staged order management allowed enabled in TT User Setup may take ownership of an available staged order. This includes users sharing an order book. Note: X_TRADER (non-Pro) users sharing an order book cannot submit, manipulate, or view staged orders; however, they can see the related child orders. Tip: You can set the New Staged Order property in the Sounds tab to play an alert whenever a staged order appears. Execution traders may take ownership of Available staged orders that they would like to manage. There are multiple ways to claim an order. For example, after selecting the order in the Orders Pane, you can click the Claim button on the Order Toolbar. Confirmation will be required if a confirmation method is enabled on the global properties Orders tab. An alternative method allows you to select the order and click the Order Details (?) button. This displays the Order Details dialog box. By default, the Claim, Promote, Unclaim, and ? buttons are not displayed on the Order Toolbar. These buttons can be added from the global Properties Orders tab. By default, the Order Details columns is not displayed in the Order Pane. You may enable this from the Orders Pane right-click context menu Show Hide Columns | Column Configuration dialog box. 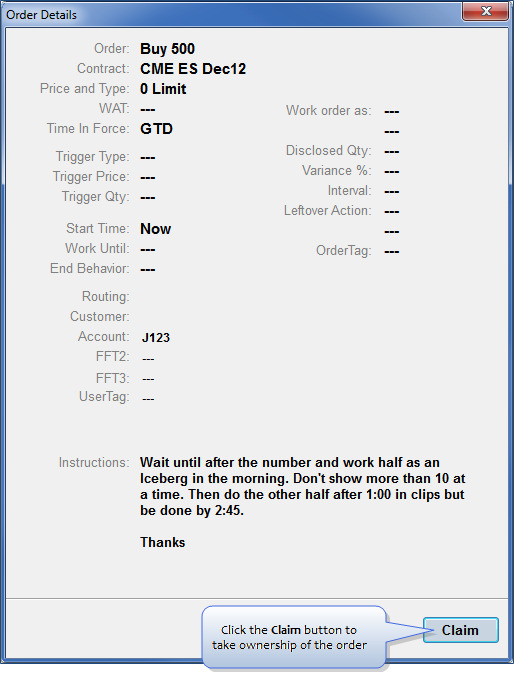 Click to select an available staged order displayed in the Orders Pane. Click the Yesbutton. The Order Details dialog box appears. Click the Claimbutton to take ownership of the order. Click the Order Details (?) button. The Order Details dialog box appears. Once claimed, only the execution trader that owns the staged order has the ability to work it until unclaimed. Users sharing an order book with the execution trader can see the order and monitor the execution progress, but cannot act on the order. If needed, the current owner can unclaim the staged order, making it available to other users to claim and execute. The TTStatus field displays Owned. The Owner field displays the owner’s TT User Setup Username. The owner is attached to the staged order and all future related child orders and fills that occur while the trader manages the staged order. A blue buy (B) or red sell (S) button indicates the execution trader can enter a child order. The Buy/Sell buttons continue to display until child orders are placed for the full quantity of the staged order. INFO messages are written to the Audit Trail for each claimed staged order as shown in the screen shot below. Provided the staged order is in either Working (W) or Partially Filled (P) state, you (or users with Administrator permissions) can relinquish ownership. 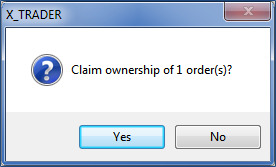 After selecting one or more of your owned staged orders in the Order Pane, click the Unclaim button on the Order Toolbar to release ownership of the selected orders. After click the Unclaim button, confirmation will be required if a confirmation method is enabled on the global properties Orders tab. Unclaiming ownership removes the execution trader's ownership from the staged order but continues to display the trader's Username in the Owner field as an indication of the last user who touched the staged order. Execution traders sharing an order book may not release staged orders owned by another user. Only the owner of the order (or an Administrator) may unclaim a staged order. All related child orders in Working (W) state continue to work and retain the unclaimed owner’s Username. By default, the Unclaim button is not displayed on the Order Toolbar. This can be added from the global properties Orders tab. Separate INFO messages are written to the Audit Trail for each unclaimed staged order as shown in the screen shot below. Click to select one or more staged orders owned by you displayed in the Orders Pane. Click the Unclaimbutton. If you have a confirmation set up, the confirmation dialog box appears. Click Yes to confirm. The TTStatus field changes to Available.